Popular culture in the latter half of the twentieth century precipitated a decisive change in style and body image. Postwar film, television, radio shows, pulp fiction and comics placed heroic types firmly within public consciousness. 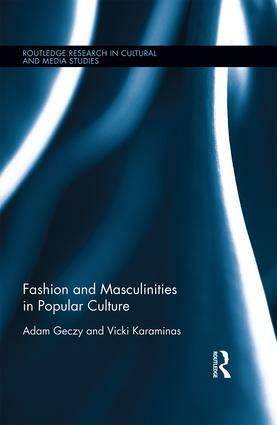 This book concentrates on these heroic male types as they have evolved from the postwar era and their relationship to fashion to the present day. As well as demonstrating the role of male icons in contemporary society, this book’s originality also lies in showing the many gender slippages that these icons help to effect or expose. It is by exploring the somewhat inviolate types accorded to contemporary masculinity that we see the very fragility of a stable or rounded male identity. 1.2 The "Crisis of Masculinity"
4.7 Sailor Chic. From Boardwalk to Catwalk. 7.6 Who Does Batman Bat for? Adam Geczy is Senior Lecturer and Chair of the Faculty Board of Sydney College of the Arts, University of Sydney, Australia. Vicki Karaminasis Professor of Fashion and Deputy Director of Doctoral Research at the College of Creative Arts, Massey University, New Zealand.